There were those who still dreamed of A Farewell To Arms. They'd gather at the Academy to screen "Old Oscar Winners" in July 1948 where sixteen-year-old Farewell said Hello again. Maybe this was what got producer Jerry Wald excited, because within weeks he was touting long-retired Greta Garbo's "keen interest" in top-lining A (new) Farewell To Arms. Just For Variety columnist Florabel Muir cattily tabbed GG as a bit beyond the stage of young and bubbling love as exemplified in the Hemingway novel that served Helen Hayes, Gary Cooper, Frank Borgaze, and Paramount so well around 1930. Wald, however, was undaunted. Within days, he was floating Humphrey Bogart as possible co-star to Garbo, a combo that would bring 'em in at the boxoffice, said Jerry. Cooler heads prevailed by a following month: Warner Bros. had several years before (1946) traded A Connecticut Yankee In King Arthur's Court, plus another property they owned, to Paramount in exchange for novel and negative of A Farewell To Arms, and WB plans were afoot to begin a remake by January 1949. 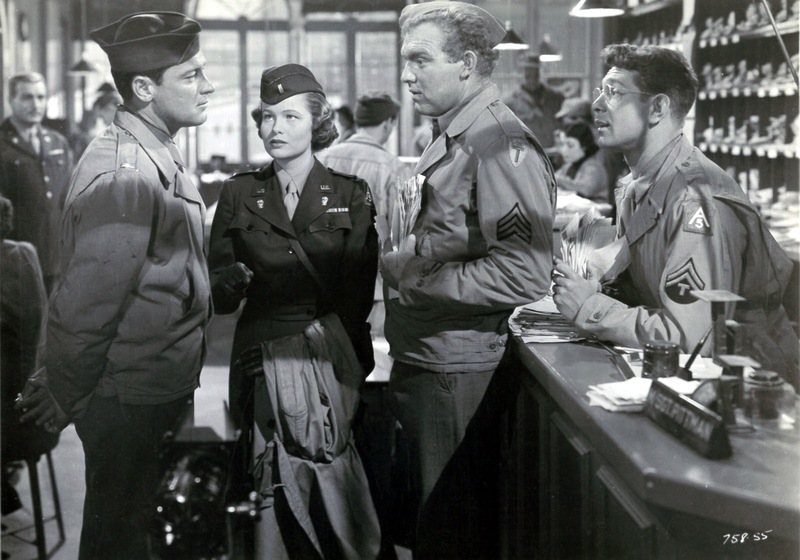 WB wanted Jerry Wald teamed with John Huston to produce-direct A Farewell To Arms, a hopeful repeat of their recent success with Key Largo, but Huston was now freelancing and attached to MGM for a next project. 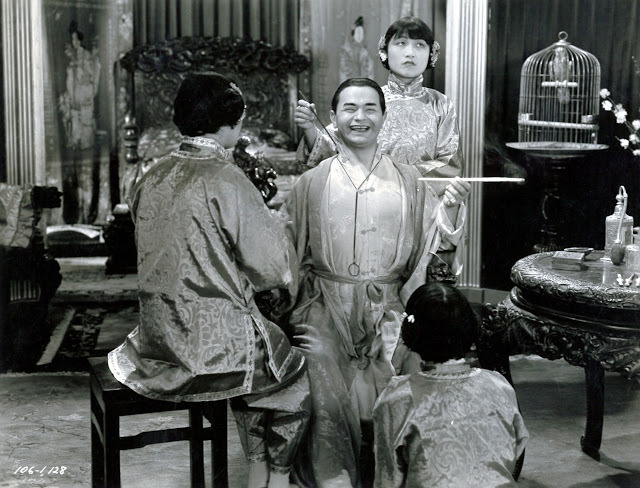 Plans went nowhere over a coming year, and in November 1949, Warners conceded that a Farewell remake would not be coming any time soon. 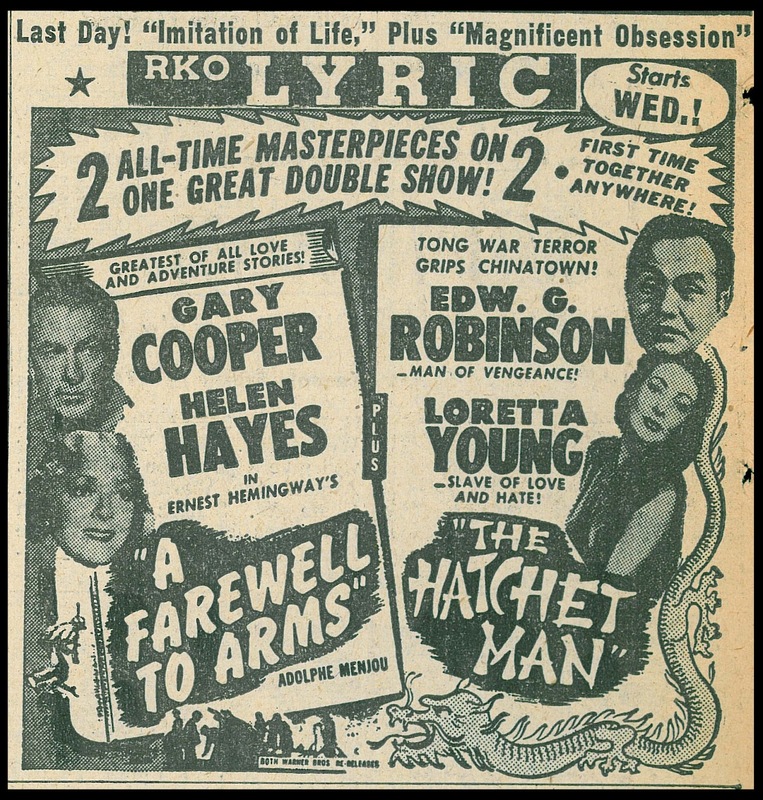 Instead, they would reissue the '32 original on a combo with The Hatchet Man, another relic of precode yore (also 1932) that would presumably require censor fumigating just as had Farewell for its 1938 return. Warners, as well as an industry overall, wanted to slow reissues in favor of upgraded new pics and a finish to double-feature policy long a pox on majors. Besides, oldies weren't selling. Few of them can do enough business in the present market to merit the expense involved in turning out new prints, accessories, etc., said Variety in an April 1950 survey. A late reminder of A Farewell To Arms came when Gary Cooper faced radio mikes in January 1951 to reprise his Lt. Frederic Henry role, with Tallulah Bankhead essaying the Helen Hayes part. These dramatic highlights were but part of 1/28's The Big Show broadcast, Bankhead's ambitious, and star-laden, weekly visit to home listeners. Coop had maybe been yup-and-nop'ing it too long: Variety's review found the actor stiff, and his monosyllabic style didn't suit (although GC redeemed himself later in the program with a comedy take-off on slow spoken cowboys). 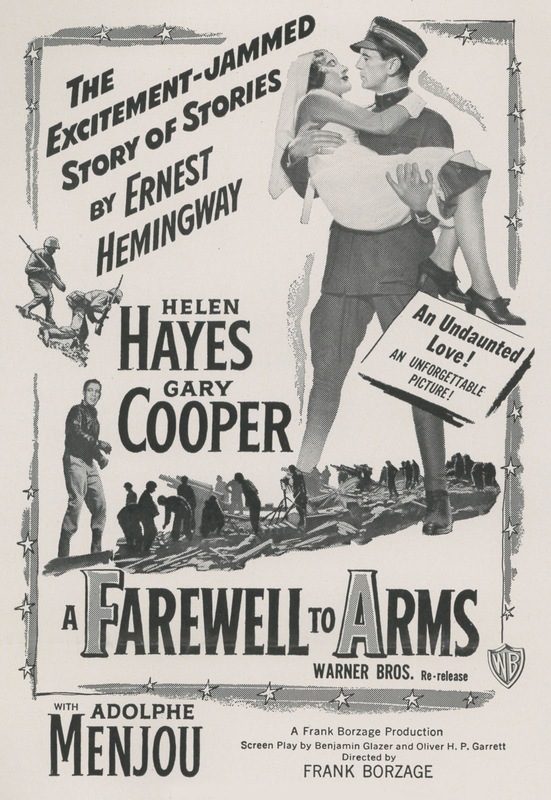 Warners meanwhile looked to sort-of reprise A Farewell To Arms, their variant to be called Force Of Arms, its story an "original" by Richard Tregaskis, but borrowing elements from the Hemingway novel. As WB still owned that, they'd have no worry re poach claims. Plans started out modest in any event, Richard Todd and Ruth Roman to star. 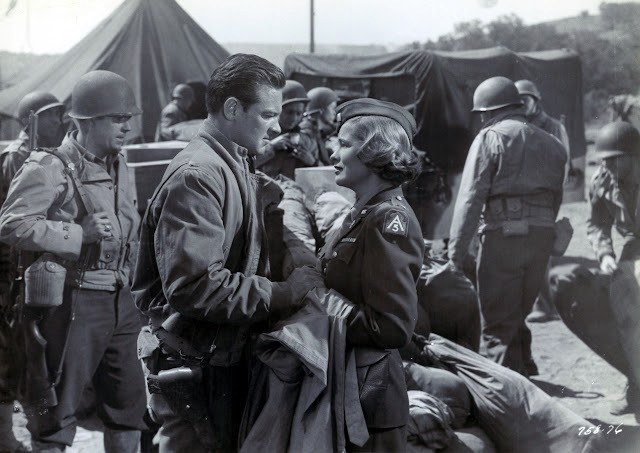 The project got upgraded when hot off Sunset Boulevard William Holden came aboard, along with his Paramount co-star Nancy Olson. Now it looked as though Force Of Arms might compete with MGM's war-set Battleground for patronage again engaged by combat subjects. WB had several WWII projects in progress, Variety counted five in mid-1950, and advance guard for Force Of Arms would include Breakthrough, Operation Pacific, and The Tanks Are Coming (Tanks released right behind Force Of Arms). 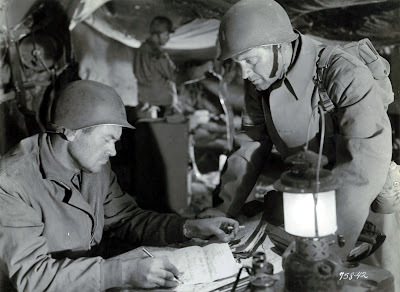 Half-part romance with the rest spent on battlefields, Force Of Arms trades well on newly conflicted William Holden, never again the "Smiling Jim" character he so deplored. The suddenly seasoned actor brought cynicism to warring that was at odds with formula-derived GI's surrounding him. We'd not had attitude like Bill's in flag-waving gone before. He represented a 50's-era reappraisal of war, that to culminate five years later with The Bridge On The River Kwai. An equal of his asset to Force Of Arms was directing Michael Curtiz, past a career prime, but so were Warner movies in general. He still works wonder with movement and foregrounds; no composition lacks interest. 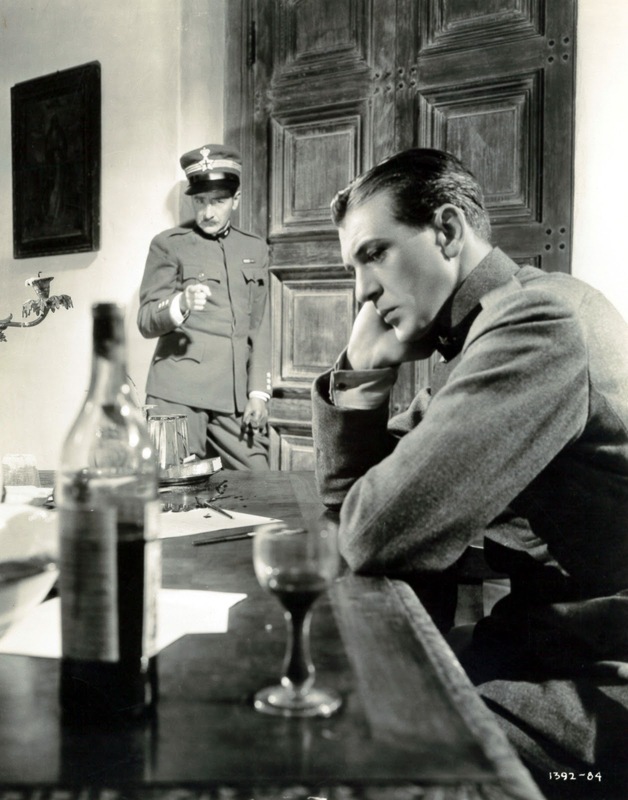 Curtiz presents the vivid whole of a soldier packed Italian gin-mill with a same authority that enhanced Casablanca Rick's. 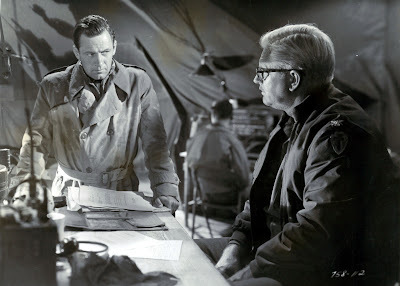 Force Of Arms would have its own reissue in the wake of William Holden's 1953 Academy win (for Stalag 17), a title change to A Girl For Joe adding confusion as Force Of Arms went out again in 1954 on a combo with another retitled Warner oldie, Guy With A Grin, released originally in 1940 as No Time For Comedy. Did entering customers imagine they would see new features with William Holden and James Stewart? Force Of Arms turns up on TCM and is also accessible from Warner's Archive. A Farewell To Arms is available from Kino in a lovely Blu-Ray. It was one of those gray, smeared prints of "A Farewell to Arms" that I first saw, at the Temple University Cinemateque in Philadelphia. Until then, I had the impression that Frank Borzage was just a studio director and something of a hack. I was very young, of course. Afterwards, I had a better appreciation of him as an artist. When I later saw such films as "Seventh Heaven," "Street Angel," and "Lucky Star," their quality did not come as a surprise to me. The film is generally faithful to Hemingway's novel in its incident and detail, though with a necessary concision. Where there is a difference, it is less in what happens as in the meaning found in it. The sordidness remains, but pessimism and futility give way to a sense of transcendance which was always implicit in the love of the young man and woman. Thus in the novel, Catherine will not let Frederic marry her, for fear that regulations will require them to be separated. In the film, the priest, who knows that they are lovers, stands apart from them and murmurs the words of the marriage sacrament. They hear him, each takes the hand of the other, and in that moment, their love is truly consummated, as through God's grace, freely given. Later, Frederic flees the madness of the war and finds Catherine at a hospital in Switzerland. Their child has been still born and she is close to death. He waits in a cafe, his brioche and coffee taking the place of the bread and the wine, praying aloud to the one who always listens. He comes back to the hospital, but she is dying and does not want to. He knows this and has her repeat after him that they will always be together in their love, whether in life or death. She does so, and as she realizes the truth of it, and that she is not afraid, she dies. In that moment, the armistice is declared, people cheer, the church bells ring, and a blast of steam issues from the whistle of a factory. In the midst of this celebration, Frederic lifts her body towards heaven, sagging beneath the weight of his sorrow, though she is so light, and cries in a broken voice, "Peace, peace." 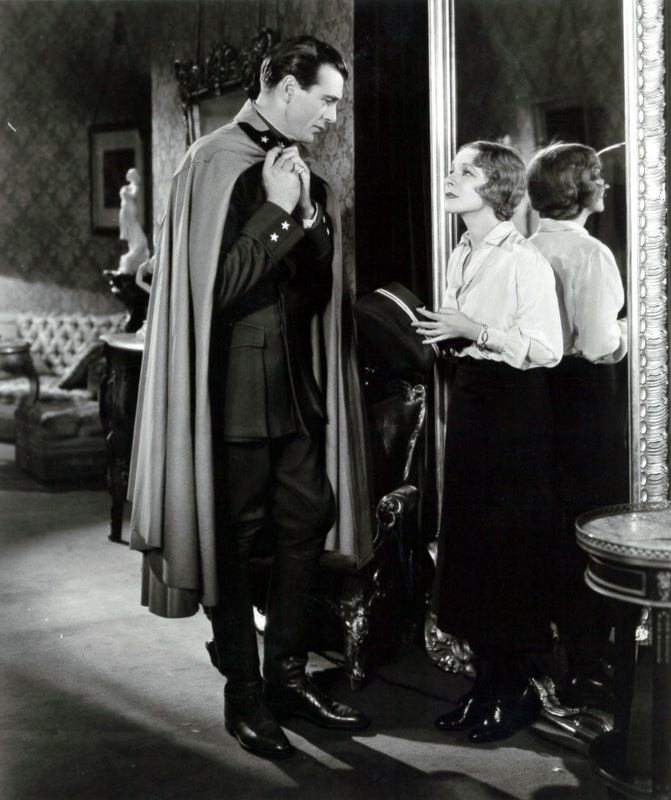 It is shattering, this ending, for the utter sincerity of Gary Cooper and Helen Hayes as the lovers, and for Frank Borzage, our guardian and guide to the open heart.